Morfa Rhuddlan commemorates the savage defeat of the Welsh by the Saxons at a battle at Rhuddlan Marsh in 795. "Having crossed the river Conwy, or rather an arm of the sea, under Deganwy, leaving the Cistercian monastery of Conwy on the western bank of the river to our right hand, we arrived at Ruthlan, a noble castle on the river Cloyd, belonging to David, the eldest son of Owen, where, at the earnest invitation of David himself, we were handsomely entertained that night." "There is a spring not far from Ruthlan, in the province of Tegengel, which not only regularly ebbs and flows like the sea, twice in twenty-four hours, but at other times frequently rises and falls both by night and day." "Many persons in the morning having been persuaded to dedicate themselves to the service of Christ, we proceeded from Ruthlan to the small cathedral church of Lanelwy: from whence (the archbishop having celebrated mass) we continued our journey through a country rich in minerals of silver, where money is sought in the bowels of the earth, to the little cell of Basinwerk, where we passed the night." (Gerald of Wales) describing his journey around Wales with Archbishop Baldwin in 1188, from Itinerarium Cambriae, 1191. Construction of Offa's Dyke, near modern-day Prestatyn, marking the first effective Welsh-English border. Battle of Morfa Rhuddlan. Saxon victory, under Offa, King of Mercia over King Caradog ap Meirion. Anglo-Saxon Cledemutha founded by Edward the Elder. Castle built by Llywelyn ap Seisyll after he invaded north Wales and slain Aeddan ap Blegywryd, Prince of Gwynedd and his four sons in 1018. He was assassinated shortly afterwards. Gruffydd ap Llywelyn's settlement at Rhuddlan destroyed by Harold. Silver coins minted at Rhuddlan in the reign of William the Conqueror. Gruffydd ap Cynan captures bailey of Robert's castle, but fails to take the mound. Rhuddlan was recorded in the Domesday Book as Roeland. Rhuddlan captured by Owain Gwynedd. Rhuddlan recaptured by the English. Rhuddlan recaptured by Owain Gwynedd after a three month siege. 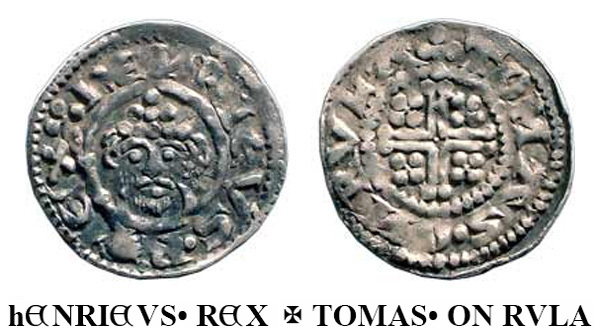 Silver coins minted at Rhuddlan in the reign of Henry III. Rhuddlan captured by English under Henry III. Grant to Edward, the King's son, of Ireland, the Earldom of Chester (including Rhuddlan), the King's lands in Wales, the Channel Islands and Gascony. Dominican Priory, Rhuddlan, founded in or before 1258, dissolved 1538. Treaty of Montgomery: Llywelyn ap Gruffydd receives Rhuddlan and the four border cantrefs. Edward absent on Crusade; succeeds to the English crown as Edward I in November 1272. Edward I's first Welsh war; Llywelyn ap Gruffydd surrenders at Rhuddlan. Construction of Rhuddlan Castle and new town. Work in progress on canalising and deepening of River Clwyd, 'The Great Ditch' by 968 navvies. Elizabeth of Rhuddlan, also known as Elizabeth Plantagenet born at Rhuddlan Castle, daughter of King Edward I and Queen Eleanor. Edward I's second Welsh war and death of Llywelyn. Legend has it that Llywelyn's severed head was brought to Edward I at Rhuddlan. Statute of Wales (Statute of Rhuddlan) proclaimed at Rhuddlan. St. Mary's Parish Church founded. King Richard II imprisoned at Rhuddlan Castle. Acts of Union: Welsh shires represented in English Parliament. Rhuddlan in County of Flintshire. Dissolution of the Dominican Priory by Henry VIII. A bridge with two arches rebuilt over the River Clwyd showing the crest of Bishop William Hughes, Bishop of St. Asaph. Civil War: Rhuddlan Castle surrendered to Parliamentarians. Ieuan Glan Geirionydd's ode - Cyflafan Morfa Rhuddlan. Vale of Clwyd Railway opened to passengers. Current spelling of Rhuddlan officially used. Noel C. Sarson; Richard H. Williams; Robert Williams; Thomas Williams; Thomas Wynne; W.H. Williams. Rhuddlan in County of Clwyd. Rhuddlan in County of Denbighshire. Rhuddlan Local Nature Reserve officially opened by Raymond Fagan. (1936-2008), a worldwide renowned photojournalist, unveiled at Monfa. now in present-day Edessa (Şanlıurfa), Turkey.